Mirror or Brushed Chrome Trumpet Base. Also SPARE seats only in Black . 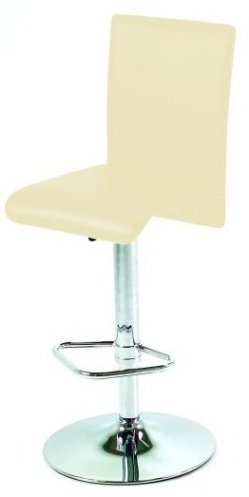 The Casanova Bar Stool has been a very popular Adjustable Height, Swivel Bar Stool. We have sold about 10,000 in the last ten years. Sadly the factory have decided to stop production of this model. We have sold all complete stools and even our spare parts are almost sold out. We can supply spare seats only in Black Leather, but NO BACKS. Please see below for more information. Black Seats only - First Quality & Slightly Damaged. 1 Brown Seat & Back - Slightly Damaged. No Brown or Cream Seats. Gas Columns - First Quality New. Please contact us if you need any spares. Advise what you want and the number(s). We will check our current stock and advise what we can supply and the cost. "Very many thanks for excellent service. The Assembled Casanova stools arrived on time, very well packaged and undamaged. We were thrilled with them and they have been well admired- they fit in well in our new kitchen extension. As a novice to internet buying, I was very sceptical about doing it, but now I am confident and will certainly buy again. Many thanks once again." We have had our Casanova stool about 6 years. When the stool lost its gas I called Graeme for advice. He talked me through dismantling the stool and also sent an excellent video demo. We were able to order a new gas cylinder which was delivered overnight to us. Fabulous friendly service! We are most impressed and would recommend the company to anyone. Many thanks to Graeme. I just wanted to say how delighted we are with the Casanova Stools. Your Service, Quality and Price are all Outstanding. Even the Self Assembly was a Pleasure - I don't think I have Ever Seen More Thoughful Instructions. Many Thanks. Thank You for Your Great Service - Stools Arrived Very Promptly and Look Great in Our Newly Designed Kitchen...Love Them! Will Recommend your Website to Friends - We were. The Bar Stools Arrived Today....They are Fabulous, We're Thrilled with Them. During the Whole Process of Having the New Orangery Built to House the New Kitchen, Every Single Thing Has Caused us Problems ... Except the Bar Stools...Hurray!! Thank you for Making the Whole Process Pain Free.